Detective Vic Mackey is the leader of an elite Strike Team unit, a group of cops effective at eliminating crime but also operating under Vic's own set of rules. But his rules sometimes cross the fine line between legal and illegal. Now the precinct has a new captain who doesn't like Vic's tactics and wants to bust him off the force - even as the captain finds himself going to Vic for help whenever the going gets rough. Now is your chanc..
After a rocky start, Detective Vic Mackey and Captain David Aceveda have formed an uneasy alliance that Detective Claudette Wyms is determined to destroy. Vic's personal life is in shambles and a new nemesis on the street forces the Strike Team to risk everything in the pursuit of one last big score for their "retirement fund." "The Shield" made history with the most Emmy nominations ever for a basic cable drama. 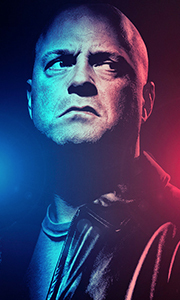 It won a Golden Globe f..
TV's hardest-hitting cop drama returns with a vengeance for a pulse-pounding third season! After scoring big with the money train, the Strike Team play it cool to avoid arousing suspicion as Dutch and Claudette investigate the robbery and murder of two Armenian gangsters. Tensions are stretched even further when Vic finds himself at odds with his team as they face a bitter rivalry from the new Decoy Squad. But hostilities are quickly fo..
TV's most in-your-face cop drama returns with a gripping, take-no-prisoners fourth season! Life at the Barn may never be the same after the Strike Team is dissolved and Vic and Shane are assigned to regular detective duty. Captain Aceveda is also leaving to begin his new job on the City Council. Any hope that Detective Claudette Wyms had of assuming Aceveda's command is dashed when another female, Monica Rawling (Glenn Close), is chosen..
As the Strike Team battles racial tensions in the city, friction inside the Barn escalates with the arrival of Lieutenant Jon Kavanaugh (Forest Whitaker), a dogged Internal Affairs cop obsessed with taking down down Vic Mackey, squeezing Vic's ex-wife Corrine, to do it. In the midst of this chaos, Dutch and Claudette's work relationship grows strained, Danny refuses to reveal the father of her baby and Julien struggles with a new, attra.. Even as a hardened cop, things have never been tougher for Detective Vic Mackey. In The Shield's riveting sixth season, he must deal with a vicious, gang-related slaughter with no leads, the desperate attempts of an Internal Affairs detective to discredit him, and the looming threat of forced retirement. To top it all, he's obsessed with finding the killer of a valued Strike Team member and friend. Meanwhile, Shane hooks up with the Arm..
Now, after seven edge-of-your-seat seasons, you can finally see how this award-winning FX drama turns out. Shane resorts to kidnapping in his dangerous dance with the Armenian mob, Dutch risks everything by becoming personally involved in a homicide investigation, the Strike Team mobilises to free a drug lord's daughter - but it all comes down to Detective Vic Mackey confronting his greatest adversary: himself. Pressured to take down Pe..
Own The Shield Seasons 1 to 7 Complete Collection DVD from Deff, DVD, Blu-Ray & 4K Video Specialists - Free UK Delivery..